BORN in Paisley in 1961, Steven Moffat started his career as a teacher before a fortuitous chain of events allowed him to create the hugely successful Press Gang for Richmond Films. Five series on and a couple of top industry awards later, he had established himself as a writer who could stretch the traditional 25 minute format into new and fascinating shapes, and drive astonishing emotional drama from what could have been 'merely' top-notch humour for kiddies. His adult situation comedies – Joking Apart, Chalk and Coupling – have enjoyed varying degrees of success. Each of them demand considerably more from the viewer than the average comedy half-hour, with Coupling in particular creating dizzying new narrative templates, and executed to perfection in episodes such as Split and Nine and a Half Minutes. As a life-long fan of Doctor Who, it is fitting that the series has given Moffat his most mainstream successes to date, with the instantly-iconic gasmask-wearing "Are You My Mummy?" boy from The Empty Child/The Doctor Dances winning him the Top TV Moment of 2005, and The Girl in the Fireplace earning him a second Hugo award. 2007 brought his first post-watershed drama, in the form of the astonishing Jekyll, and a bonkers time-bending romp in the form of Time Crash for Children in Need. 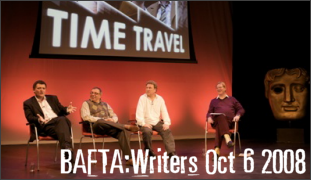 2008 brought a double bill of Doctor Who episodes – Silence in the Library and Forest of the Dead – and delivered two BAFTA awards for Blink, as well as a third Hugo Award. 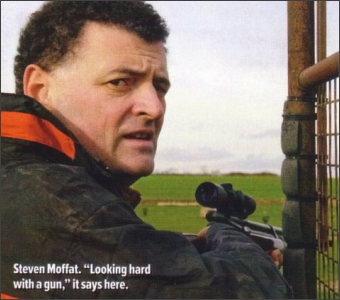 In May 2008 it was announced that Steven Moffat would be Lead Writer and Executive Producer for Series 5 of Doctor Who, although this proved to be at the expense of his involvement in the TinTin movies for Steven Spielberg and Peter Jackson. January 2009 saw the casting of a new Doctor, Matt Smith, followed in May with the announcement of a new companion, to be played by Karen Gillan. Not content with taking control of the Who universe, the Moff has also been hard at work on other projects. Spring 2009 saw the completion A Study in Pink, a pilot film featuring a 21st century version of Arthur Conan Doyle's legendary detective. 2011 has seen the Doctor return to BBC1 for a further 13 episodes, three more episodes of Sherlock filmed for early 2012, the release of The Adventures of Tin Tin: Secret of the Unicorn (which retains his script credit), and a plethora of new awards for the groaning mantelpiece. He is currently hard at work on the 2013 Doctor Who Christmas Special. Watch this space for more news of Sherlock, Adam & Eve, the (possible) return of Press Gang, and of course any developments on Doctor Who. This is a not-for-profit fan site, created for information and entertainment only. No copyright infringement is intended. Website live since November 2006. Pages most recently updated on Monday November 25, 2013. Part of the Impossible Things network.